Theodore E. Roth, Jr. was born on Easter Sunday, April 20, 1924, at Bethel Deaconess Hospital in Newton, Kansas to Rev. Theodore E. Roth Sr. and Hazel Elizabeth (Mellor) Roth. He departed this life on April 2, 2019, at Wheat State Manor in Whitewater, Kansas at the age of 94, just 18 days short of his 95th birthday. Ted grew up on a dairy farm one half mile north of Whitewater, Kansas where he and his siblings were introduced to long hours of hard work during the "Great Depression". He attended Whitewater grade school and high school. In February of 1942, Ted dropped out of high school during his senior year to volunteer for service in the U.S. Navy but was needed at home to help on the farm. Finally, on August 3, 1942, Ted was on a train to Kansas City to the Naval Recruiting Station. He went through Boot amp at Great Lake Naval Training Station located about 40 miles north of Chicago. Following Boot Camp, he went through Aviation Machinist Mate School in Norman, Oklahoma. From there he attended the Naval Air Gunnery School in Purcell, Oklahoma. Then it was off to Jacksonville, Florida to the U.S. Naval Air Station where he entered into training in a P.B.Y. Squadron for submarine patrol duty on the east coast from Charlotte, South Carolina to Key West, Florida. He transferred to San Diego, California in May of 1943 to go into training on B-24 land-based planes which were four-engine bombers getting ready for duty in the South Pacific. Training took place at North Island Naval Air Station in San Diego. Replacement crews needed for deployment to the South Pacific assembled at the Consolidated Valltee Aircraft Factory in San Diego. Ted had a keen interest in the B-24 and was chosen to attend school at the aircraft factory. When his crew gathered to get acquainted, they were assigned to AIRCRAFT SERIAL NUMBER 67799, a serial number which Ted remembered for the rest of his life. The plane turned out to be a C87. The C87 was a make-over of the B-24 Bomber which had been modified to carry personnel. When the seven members of #67799 all assembled, there were seven … a pilot, co-pilot, navigator, radioman, and three aircraft mechanics. The pilot, a Lt. Commander, informed the crew that they were to be stationed in Brisbane, Australia and they were going to be the "Flag Plane" for the Seventh Fleet Commander who was four-star Admiral Thomas C. Kinkaid. They took possession of their plane on March 23, 1944, and flew to Australia by way of Pearl Harbor, the Island of Canton, Canton to Mandi and the to Brisbane. The crew flew out of Brisbane for about four months and then they were transferred to Port Morsby, New Guinea. Port Morsby was the first flight into the war zone, which occurred on April 20, 1944 Ted's 20th birthday. From Port Morsby the crew went to Hollandia, New Guinea and then the Leyte Island in the Philippines. The crew was told that if they had to ditch the plane to choose water and NOT the jungle as the Japanese still controlled most of New Guinea and also Leyte. The crew flew Admiral Thomas Kinkaid and eight other Admirals for the next year and a half and logged over 800 air time hours all across the South Pacific. When the war ended, the crew and their plane were stationed in Leyte. When back in the U.S. Ted was stationed at Olathe Naval Air Station. Ted was always very passionate and emotional when he spoke of his Naval career. After being discharged from the Navy on January 28, 1946, Ted went into the trucking business. On December 15, 1946, he married Lois Maxine Wilson in Wichita, Kansas. Lois was teaching in Whitewater at the time. In 1958 Ted secured a job buying cattle for a firm in San Antonio, Texas. This led to buying for other firms in Oklahoma City, Oklahoma, Wichita Falls, Texas, Shreveport, Louisiana, Montgomery, Alabama, Ark City, Kansas, and National Packing Company in Kansas City. In 1961 he built a small stockyards one-half mile east of Whitewater and started bringing calves from the southern part of the U.S. and selling them to local farmers. In 1967 there were nearly 17,000 cattle that went through his facility. Ted always stated that this was a most enjoyable part of his life. In 1971 Ted sold the cattle and trucking business as National Packing Co. had moved to Western Kansas to be near the many feedlots. He helped establish and become a partner in the Wichita Kenworth Truck Dealership. In 1974 he sold his interest in Kenworth and Stated Ted Roth Truck Sales which continued until 2003. Ted was a "dreamer" and built six motor homes from 1973 until 1992. He and Lois and the three younger girls took many trips in these motor homes, logging 183,000 miles in five of the six motor homes he had built. In 1976 Ted brushed off death. He was not feeling well and could not stand the smell of food. He lost 31 pounds in seven weeks, and it was discovered that he had a large tumor on his stomach which turned out to be cancer and if not treated immediately it would be fatal in six months. His brother, Bob, convinced him to forget the surgery he was to have the next day and go to Mexico for treatment. Ted flew to Mexico a few days later and went into a treatment with Laetrile which worked well. This was one of many times in his life that the prayers of his parents and others spared his life. Ted was a member of the Swiss Mennonite Church from 1942 until 1995. He then joined the Palmyra Baptist Church for two years and then joined the First Mennonite Church at Burns, Kansas where he met Elmer Reimer, the Pastor. Elmer and Ted became very close friends. After a heart attack in June of 2004, Ted closed his business, and everything was sold. He and Lois moved to Newton where they both joined the First Church of the Nazarene. 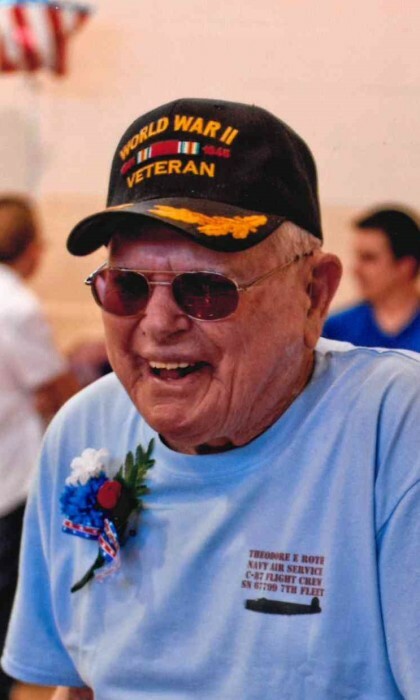 Ted was a member of the American Legion Post #65 in Whitewater from 1946 until the time of his death. In 2013 he received a certificate for sixty-eight years continuous membership. Ted and Lois were members of the Family Motor Coach Club, the Good Sam's Club, and the Pelican Travelers Club of Shreveport, Louisiana for many years. They made many trips to join in on their meetings and have some good times. They had very close friends in these clubs. Special friends were a great influence and added much enjoyment to Ted's life. Some of these special friends included G. Christian Weiss, Jim and Barbara Law, Arnold Ensz, Elmer Reimer, Blaine Bowlin, Paul Androse and many friends from Nazarene Church not to mention all of his friends in and around the Whitewater. Ted was preceded in death by his parents, Ted and Hazel Roth. Hazel Passed away in 1979 and Ted; Sr. passed away in 1981. Ted's life was deeply affected by the passing od his brothers Paul (Buddy) in 1955 at twenty-three, Daryl (Fritz) in 1965 at age twenty-eight, Robert (Bob) in 1967 at age sixty-seven, Wilford (Bill) in 2004 at age eighty-two, and his only sister Betty in November of 2018. He lost Lois his wife of 65 years on March 3, 2012, at the age of eighty-four, their oldest son, Mike on August 28, 2012, at the age of sixty-three, and his daughter, Julie on April 2, 2016. He leaves behind six of his children: Karl (Bobbie) of Mataranka, Northwest Territory, Australia, Jeannie (Larry) Frost of Gore, OK., Margie of Towanda, KS., John of Newton, KS., Fritzie (Mark) Hatfield of Burns, KS., and Kristie (Doug) Swift of Clearwater, KS. He also leaves behind twenty-two grandchildren, thirty-nine great-grandchildren and four great-great-grandchildren whom Ted considered a great addition to his life. He loved them all. Ted also leaves behind a multitude of wonderful friends and though cut off by death and divorce, two former family members Ted loved as his own. They are Carolyn (Mike) Linehan and Summer Roth.